The N4906B Serial BERT is a general-purpose bit error ratio tester designed for testing high-speed digital communication components and systems. 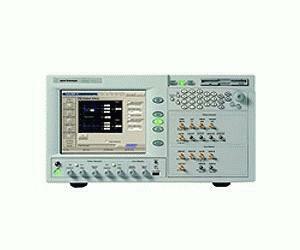 It is ideal for cost-effective manufacturing and telecom device testing. The N4906B Serial BERT provides the same excellent signal performance as the N4901B/02B Serial High-Performance BERT. The N4906B is offered in a 3.6 Gb/s (option 003) and a 12.5 Gb/s (option 012) version. Both consist of a pattern generator and error detector with excellent price/performance ratio. The 12.5 Gb/s analyzer can be configured with CDR (option 102) to test clock less interfaces and with true differential inputs (option 101) to test LVDS and other differential interfaces. The 3.6 Gb/s analyzer is equipped with true differential inputs. The compact size of the N4906B saves rack space. LAN, USB and GPIB interfaces allow smooth integration into automated test environments. For bench users the N4906B Serial BERT offers an intuitive user interface with state-of-the-art Windows-XP based color touch-screen.